"The classic original Beatles studio albums have been re-mastered by a dedicated team of engineers at Abbey Road Studios in London over a four year period utilising state of the art recording technology alongside vintage studio equipment, carefully maintaining the authenticity and integrity of the original analogue recordings. The result of this painstaking process is the highest fidelity the Beatles catalogue has seen since its original release. Within each CD's new packaging, booklets include detailed historical notes along with informative recording notes. For a limited period, each CD will also be embedded with a brief documentary film about the album. The newly produced mini-documentaries on the making of each album, directed by Bob Smeaton, are included as QuickTime files on each album. The documentaries contain archival footage, rare photographs and never-before-heard studio chat from The Beatles, offering a unique and very personal insight into the studio atmosphere." Japanese exclusive reissue of 1963 album. This Toshiba/EMI pressing features an OBI strip (different from the last Japanese pressings issued in 1990) & an insert with Japanese text & lyrics in Japanese & English. Manufactured & pressed in Japan. This album has been direct metal mastered from a digitally remastered original tape to give the best possible sound quality. 2003. One afternoon after school, you take a walk to you local record shop. You walk over to the counter, and ask the salesman - "Do you have that new record by the Beatles?" And the salesman smiles, and says: "Sure do, son; got a new shipment today. They've been selling like hot cakes". And you give him 75p (or whatever a record cost back then) and he hands you the record. And you go home, and close the door to your room, and place the record on your gramophone, and place the needle on the record. And you hear a click and some hisses, and then a young man with a heavy Liverpoolian accent yells out "One, two, three, four! ", and an electric guitar starts playing. And your life is changed forever. It may be, as Jack Black's character in High Fidelity would say, painfully obvious and trite to say it, but 'I Saw Her Standing There' is still one of the best opening tracks on a rock album, ever. Even now, with all the distance the music business had come, it's hard to resist the sheer contagiousness of the song's rhythm and of Paul's youthful energy. Even though the song shows heavy influences of the likes of Jerry Lee Lewis and especially Little Richard - who were, of course, among the Beatles' idols - the observant listener could have heard even then, in 1963, that this was something new, something that would change the course of musical history. The true British rock n' roll was born with Please Please Me. Although I was born a full two decades after this album was released, so I can only guess at the thrill of hearing the Beatles for the first time, back then, that is without all the myth and glamour that have been attached to them in the years since; and although I know, like everybody knows, that the Beatles created their best music after 1965, right about the time they quite touring; and despite the dated sound quality and all the other flaws that it has - flaws that are inherent in a recording made by a band where the oldest member is twenty three, at basically zero budget, in less than twenty hours, with a classical music producer working as engineer and a record shop owner working as a manager; despite all that, Please Please Me is an album that never fails to astound and amaze me. Though the sound is certainly dated, it stands the test of time like few albums from the 70s and 80s do, and appeals in so many different levels. Lennon and McCartney were at this point not entirely confident in their abilities as songwriters - they rely heavily on cover versions to their own favorite songs - but the few originals that they did write for the album - other than the opening track and the title track there are also 'Love Me Do', 'P.S. I Love You', 'Ask Me Why', 'Misery', 'There's a Place' and 'Do You Want to Know a Secret', performed by twenty year old George Harrison - are all classics, and some of the cover versions are also worthy of praise - especially John's unforgettable delivery of 'Twist and Shout', which became one of their most popular songs and left the original version far behind. A lot of people are one sided with the beatles, they either like their early stuff or they like their later stuff, I like both, though I think a lot of their best work came from their later matieral, I like the early stuff more, it's more consistant, I can enjoy the entire albums (though the whole "love" thing wears thin after a while). and the songs are really good, I think early beatles music gets overlooked, sure they are simple catchy pop songs, but they are GOOD, and it just shows how talented they were. This album has 9 Beatles originals and 5 covers. The world changed forever in 1963 with the explosion of Beatlemania and the ensuing British invasion. Almost instantly the Beatles become the world's most popular band, releasing critical and commercial smashes throughout the decade. The Beatles debut "Please Please Me" (1963) is the album where it all began. Is "Please Please Me" the Beatles best album? No. Compared to such classics as "Sgt Peppers Lonely Hearts Club Band," (1967) "The Beatles" aka "The White Album," (1968) and "Abbey Road" (1969) among others, "Please Please Me" seems trite and one-dimensional by comparison. But as the saying goes, Rome wasn't built in a day. The Beatles had to start somewhere. And while the Beatles later work is in most regards superior, the output of the Beatles early albums has much to offer. Some detractors have commented that the Beatles were a "boy-band" of their day. This is somewhat accurate in a superficial sense. Their music was infectious, poppy, and radio-friendly, the girls screamed and their image was pretty clean-cut. But unlike, say INSYNC or the Backsteet Boys, the Beatles actually played all their own instruments and wrote a lot of their own material. And while about half of their songs early on were written by other people, they weren't written by professional hit-makers, they were written by artists that the band loved. But the biggest difference between the Beatles and later-day boy bands is that the Beatles wrote and covered authentic rock n' roll songs. Everything about the early Beatles was authentic, sincere, and organic. "Please Please Me" and the Beatles other early records wasn't mass-produced schmaltz, it was something real. Part of the charm of "Please Please Me" is its nativity. Released in 1963, the 50s was just a glance away in the rearview mirror. The real 60s, with all its turbulence, activism, protests, and social progression, had not yet begun. 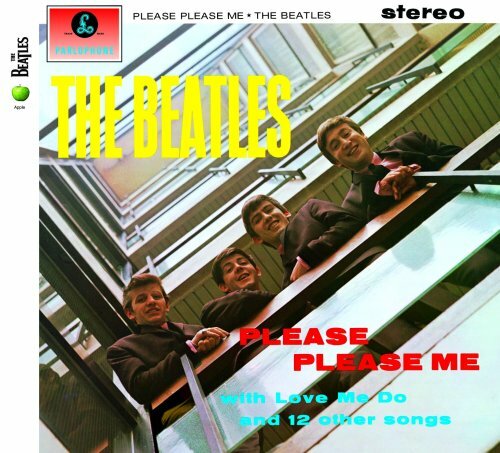 "Please Please Me" reflects the era of innocence in which it was released. While the technical and studio wizardry of the Beatles later work is undeniably groundbreaking and impressive, there is much to appreciate and enjoy from the organic meat-and-potatoes early albums. For the classic rock purist, it doesn't get much better than this. Being that there was so much hype and frenzy at the time of Beatlemania, and that so much has been written about the band since, it's easy to forget what all the hype was about; a really great rock n' roll band. Rooted in the gritty rock of the 1950s, the Beatles took the R&B based formula of such greats as Chuck Berry and Wilson Picket, and molded a sound of their own. The Beatles carefully and meticulously crafted songs that were infectious, melodic and full of lush harmonies. One of the great things about these early albums is how organic they sound. They just sound like four guys playing live in the studio, without a lot of overdubs, doing what they are do best. The chemistry of John Lennon, Paul McCartney, George Harrison, and Ringo Starr was, pardon the tired clich¨¦, magic. When these four went into the studio together and made music, there was just something wholly unique and special about it. The sound of the Beatles was pure, fresh, and it just made you feel good. It's no small wonder why even the worst of the Beatles is still better than 90 percent of what has been popular ever since. While much of "Please Please Me" are cover songs, unless you look at the credits, it's hard to know which are covers and which are original compositions, as the Beatles had a way of making anyone else's song their own. And while later-day Lennon/McCartney songs were written, more or less, by one or the other, on these early albums, collaboration between the two is more apparent. Even at a very early age, on their first album, the pop-craftsmanship of the two shines bright with such classic songs as "I Saw Her Standing There" and "Love Me Do." There are some bands where all you really need is the "greatest hits" or where you need only a few essentials, there are some bands, however, where you need to buy the entire catalogue, and the Beatles are one of those bands. While "Please Please Me" may not be their best work, it's still a classic album that offers some of the best compositions and covers of early 60s pop. One of the best beatles albums! This was the first beatles cd i got,and it was superb! It has a variety of songs and they are all magnifecent! I saw her standing there=9\10-this song makes the beatles seem pretty cool..one of my all time favorites! Misery=10\10-I like to listen to this song when i'm in misery!=)as soon as i heard it i loved it! Anna=9\10-this song is so nice!it has a nice beautiful tune and really gets you! chains=4\10-ok, this one i didnt like as much as the rest..It gets old after awhile..it's ok..
boys=6\10-this one i love to dance to!but stil not as great as others. ask me why=7\10-its pretty good..not as good as they can get though. please please me=8\10-i dont want to sound complaining but you know theres always blame in my heart! love me do=7\10-at first i really loved this song!people overplay it too much! ps:i love you=9\10-very beautiful, romantic song! baby,it's you=8\10-i really like this song! do you want to know a secret=10\10! !-whole reason i got this cd!! Only 4 Star Average...ARE YOU PEOPLE NUTS!!! This is where the British Invasion began. Modern pop music also began here. Modern music can be divided into two eras; before the Beatles and after the Beatles. This album was the beginning for the biggest rock group ever. Sure alot of the tracks are covers but the Beatles do them extremely well and the original tracks are timeless. This album may not be as good as Revolver or Abbey Road but this is the beginning and that's what makes it a masterpiece. Instead of wading into the pool, the Lennon/Mccartney song writting team dove head first into the deep end. "I Saw Her Standing There", and, "Please Please Me", have become pop standards but lesser known tracks like, "Misery", and, "Do You Want To Know A Secret", are no less impressive. "I Saw Her Standing There", is one of the Beatle's hardest rocking numbers and, "Please Please Me", with its beautiful harmonies and harmonica playing is absolutely incredible. Tracks like, "Misery", and, "Do You Want To Know A Secret", are just fun catchy tunes which are every bit as good as the other tracks. The covers aren't that bad either. The unforgettable dance tune, "Twist And Shout", has Lennon shouting himself hoarse by the end of the record and, "Boys", and, "Baby Its You", match the integrity of the originals. "P.S. I Love You", is a beautiful ballad and, "Love Me Do", is simple yet effective. Good collection of early Beatles tunes! Please Please Me is not a horrible album on any level. But compared to things to come, this is my least favorite. But It does have a few great songs. I Saw Her Standing There. Now there's a great song. Anyone will like this simple McCartney Rocker. The next best track is Please Please Me. Mostly Lennon singing, with Paul and George on backups. John really seems to take advantage of that harmonica on this album, most notably on Love Me Do, The Beatles first huge hit. Another bigger one, Twist and Shout. Here we have paul and george backing up John who's rippin' those vocal cords. Beatles first album "Please Please Me" was released in early 1963 and it was the start of the greatest rock band of all time. Already back then they proved their musicality and taste, this album offers you anything you need, rockers and ballads. Eventhough this was 40 years ago, it still feels fresh and interesting to this day. This debut mixes Lennon/McCartney songs with some covers, just like their upcoming album does, however all covers are worthwile and wellmade and the Lennon/McCartney songs are classics. The album starts with McCartney's rocker "I Saw Her Standing There" that is now a classic. It looks back to their roots, (i.e Rock n Roll) and it's both enrgic and easy to sing a long too. "Misery" is another good song, ballad from John and Paul. George Martin plays the piano here. "Anna" was a cover, but a good one. A ballad that feautures rhythm guitar. "Chains" is also a cover, a midtempo that feautures harmonica and rhythm guitar too. "Boys" is also a cover, a rocker with backround singers. Lennon's "Ask Me Why" is a ballad. Next song is a highlight, Lennon's "Please Please Me" it's meliodic sing a long lyrics and it's harmonica have become mythical. "Love Me Do" was their first single, released in 1962. It's a midtempo with a harmonica. Very catchy Beatle classic. "Ps I Love You" is a semi-ballad, it's also among the oldest songs. "Baby It's You" a midtempo cover. "Do You Want To Know a Secret" a Lennon penned song, a slow paced song too. "A Taste of Honey" is a cover too,a melancholy midtempo. "There's A Place" is a Lennon song, a midtempo rocker. "Twist And Shout" was actually a cover, but it's one of the most well known Beatle songs of this era. A real rocker. Geez, can't anyone hear McCartney's count-in that opens the first track, "I Saw Her Standing There"? It's "one...two...three...five!". This album is bookended by two of the best rock'n'roll tracks ever recorded: "I Saw Her Standing There" showing the band in top form on a timeless McCartney classic, and "Twist and Shout", a cover which blows away the original and features Lennon in top vocal form, and one of the best rock vocals ever recorded. In between is a mix of originals and cover tunes, including the excellent "Please Please Me". The Beatles were not going to be so bold as to release an album of all original material on their first outing. But we get a first glimpse of the Beatles, and they were very tight from the get-go, with excellent vocals throughout, both solo and harmony, George's excellent lead guitar, and Lennon's accomplished harmonica parts. Many people say this wasn't one of the best beatles albums, to that i say , right ok, whatever you say. This is a great album. The recording budget may have been cheaper than what the label would later spend and the recordings somewhat rushed to get an album out "while the beatles were still hot", but i listen a lot to this album, infact i listen to it more than Revolver and Sgt. Pepper. This is a classic and along with "With The Beatles" probably gives a better insight to the early beatles than the red album ever could. What a crime against art. The music is great, the cover is great, but the digital production stinks. Shame on EMI and George Martin for settling for this kind of sound quality. What an amazing feat to record your first album in twelve hours. Though to be honest four of the songs (Love me do, P.S. I love you, Please, please me & Ask me why) had already been recorded and released. My daughters and I very much enjoy this CD. We have every Beatle CD made, and this one brings us back to the voices of the early Beatles and how they sounded before Sgt Pepper and after. I love John's young voice singing "Anna" and "Misery"--I haven't heard these songs since I was 14. Despues de haber debutado en 1962 con los sencillos "Love me do" y a principios de 1963 con "Please, please me", The Beatles lanzan este magnifico primer disco titulado "Please please me". Con la mitad de los temas que son covers y otros de autor¨ªa de Lennon y McCartney. El primer tema que es "I saw her standing there", un tema puro rock and roll, cantado por Paul McCartney, luego la balada "Misery" que se destaca por su melancol¨ªa y un piano que al parecer es de George Martin. Luego vienen tres covers: "Anna", "Chains" y "Boys", estas dos ultimas cantadas por George Harrison y Ringo Starr. Despues, viene los dos temas que fueron parte del segundo single del grupo: "Ask me why" y el eterno "Please, please me", esta ultima influenciado por Roy Orbison. La segunda parte del disco, comienza con "Love me do", con una letra simple, pero efectiva, principalmente por la harmonica de John Lennon; esta version no es la versi¨®n single, y es tocado por un baterista de sesi¨®n llamado Andy White, y Ringo Starr en los panderos. "P.S. I love you", tambien cancion de amor simple, Paul dijo que se baso en una chica que ten¨ªa los nombre iniciales "P.S. "; este tema fue el lado B del single "Love me do" en 1962. Entre casi tema por medio entre covers y temas originales, siguen siendo excelentes como "Baby it's you", "A taste of honey". "Do you want to know a secret" uno de los pocos temas de la dupla compositora, cantado por George Harrison. "There's a place", un tema no muy menor, gracias a las harmon¨ªas vocales y especie de secuela de "Love me do". Al final, "Twist and shout", un tema clasico de lo cu¨¢l es imposible que nadie lo sepa. Al final, este gran disco debut del cuarteto de Liverpool, mantiene esa linea hasta "Beatles for sale", ya que "Help! ", aunque todavia estaban en la etapa beatlemaniaca, comenzaban a surgir nuevos estilos.